When past generations thought about the future, their predictions often centered on making home life easier. And where was there more room for improvement than in the kitchen? Before dishwashers, microwave ovens and garbage disposals, moms of the past (and, rarely, dads) spent a large amount of time in the kitchen preparing meals and cleaning up. 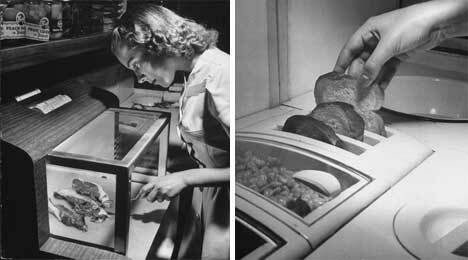 So naturally, the perception of the future kitchen was one of convenience and automation. 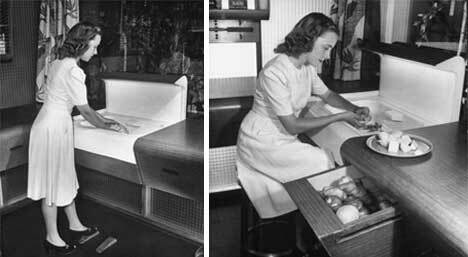 This future kitchen concept from 1943 predicted that we’d do away with pots, pans and serving dishes in favor of recessed vessels that would do it all. These chambers, made of a futuristic material called Therm-X, were set into the cooking surface and made the kitchen into a buffet. Rather than carrying serving dishes to the table, mom could simply dish up portions from right there in the kitchen. The unit’s refrigerator was an amazing chamber set into the surface of the cooking area, with a glass door to let mom know what was inside and two openings so that items could be retrieved from the kitchen or from the adjoining dining alcove. The cooker likewise featured a glass door and state-of-the-art temperature regulation. 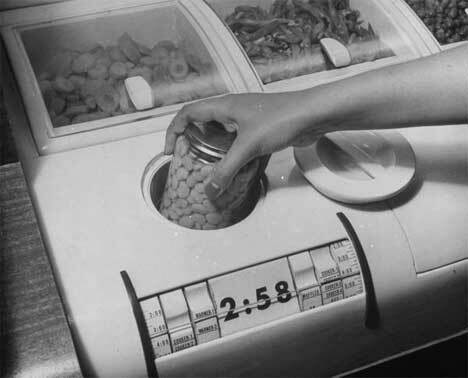 It featured a motor-driven spit so that mom could keep an eye on the rotating roast from every angle. Even the toaster was set into the countertop surface, giving even more functionality to the all-in-one space. When the integrated sliding cover was pulled over the cooking/food prep surface, the entire setup would become a desk or bar surface. The original article, which was run in the Uniontown, PA Morning Herald, claimed that washing dishes would be a thing of the past, and that the majority of the cook’s work could be done sitting down. That’s one improvement that actually has come to pass, though today the cook is often sitting in the other room watching TV while our amazing appliances take care of nearly everything. See more in Retrofuturistic or under Vintage & Retro. March, 2010.